There has been substantial criticism of Torah codes due to Drosnin's interpreting tables as warnings or predictions where the predictions turned out false. However, tables cannot be used to make predictions for two reasons: the logical problem and the incompleteness problem. A detailed discussion of these problems can be found in the Torah code tutorial. 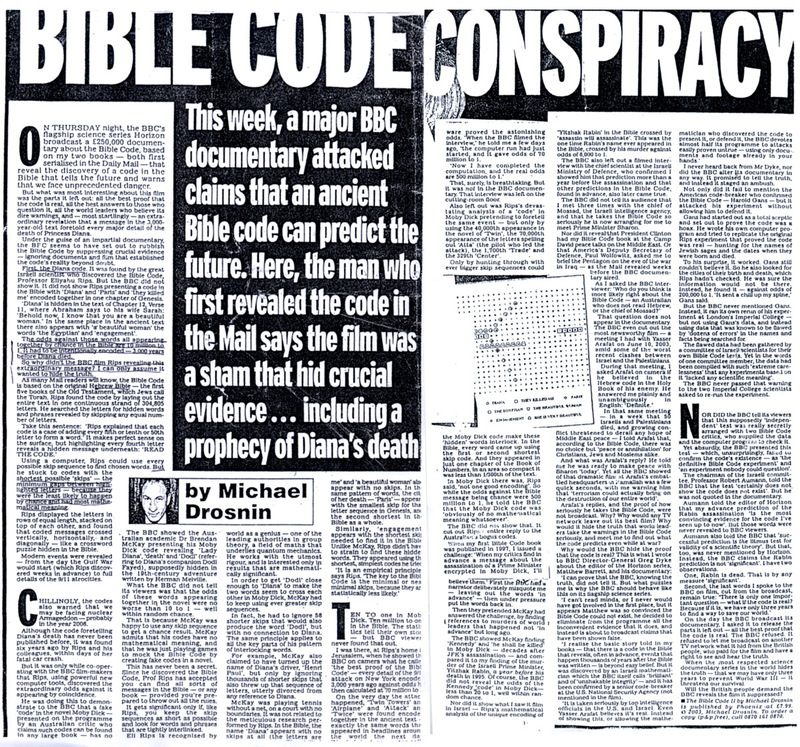 In this section we summarize a few of the false Drosnin predictions in his popular book The Bible Code. We only use key words of the form (event,year). As well we discuss the associated tables. All of them are statistically interesting, some more than the others. All the tables discussed here are produced by an experiment performed in accordance with the experimental protocol consistent with the Torah code hypothesis as discussed in the Torah code tutorial. The skip specification sets the smallest skip for each key word to be 1 and the largest skip set so that the expected number of ELSs in the random letter permuted text population is just over 10. The resonance specification allows an ELS skip and cylinder size to resonate if the ELS row skip on the cylinder is less than 10 and the ELS column skip on the cylinder is less than 10. The compactness measure is the area of the table, the number of rows of the table times the number of columns of the table. The table that we find is the smallest area table having at least one ELS of each of the key words. The monkey text control population is the ELS random placement text population. I am writing to you now because the Bible code states a new danger to Israel -- an atomic holocaust. The letter was prompted by a table Drosnin had found. 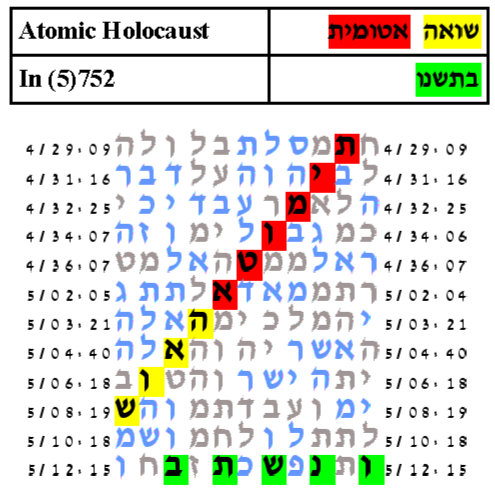 The table's key words were: שואה אטומית, atomic holocaust and בתשנו in (5)756, (1996). We did an experiment with these two key words in accordance with our standard experimental protocol. The smallest area table produced by the protocol is shown below. Our table is shown in a better geometry than the corresponding Drosnin table that appears on page 56. The probability that a text in the ELS random placement text population would have as compact a table, having at least one ELS of each of the key words as the one shown below is 13.5/10,000. The cylinder size produced by the search is 3,132. With expected number of ELSs set to 10, the probability that a text from the ELS random placement text population would produce a table as compact as the table produced here is 13.5/10,000. On January 26, 1996, Prime Minister of Israel Shimon Peres and Michael Drosnin met. At that meeting Drosnin showed the Prime Minister the atomic holocaust in 5756 (1996) table and the table of Libyan Artillery 5756. This table has two key words: תותח לובי and התשנו. Drosnin's corresponding table appears on page 62 of his book. The probability that a text from the ELS random placement monkey text population would have as a compact table is 27.5/10,000. The cylinder size produced by the search is 5,648. With expected number of ELSs set to 10, the probability that a text from the ELS random placement text population would produce a table as compact as the table produced here is 27.5/10,000. Armageddon is a hot topic. Mention armageddon and people are interested. We do an experiment with the key words: מלחמת עלם world war and התשס 5760 suggested by Drosnin on page 124 of his book. The year 2000 corresponds to the Jewish year 5760. The probability that a text from the ELS random placement monkey text population would have as a compact table is 27.5/1,000. The cylinder size produced by the search is 2,838. With expected number of ELSs set to 10, the probability that a text from the ELS random placement text population would produce a table as compact as the table produced here is 27.5/1,000. On page 124 of his book, Drosnin also has a table of world war with the year 2006. 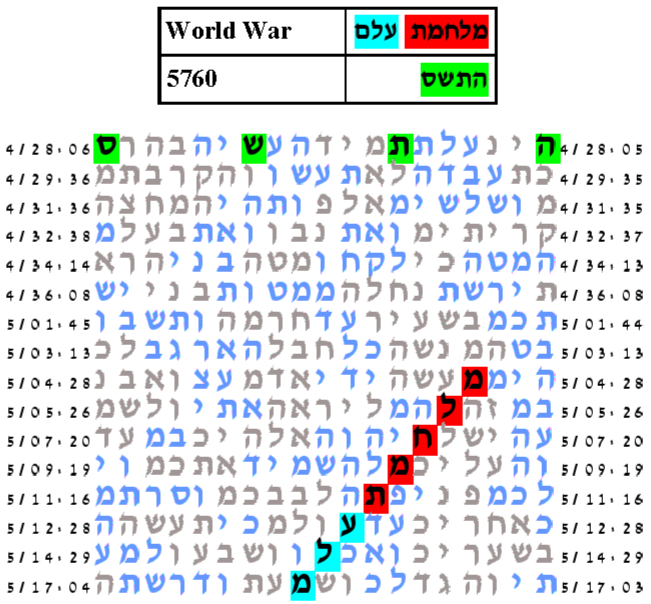 We do an experiment with the key words: מלחמת עלם world war and התשסו 5766. Here we altered our protocol to permit an ELS to be resonant to a cylinder size if the row skip or column skip is no more than 15. We had to do this because the ELS of Dronin's table has a column skip of 11. And this would not have been found with maximum column skip set to 10. The probability that a text from the ELS random placement monkey text population would have as a compact table as that produced by the Torah text is 97.5/10,000. The cylinder size produced by the search is 2,839. With expected number of ELSs set to 10, the probability that a text from the ELS random placement text population would produce a table as compact as the table produced here is 97.5/10,000. 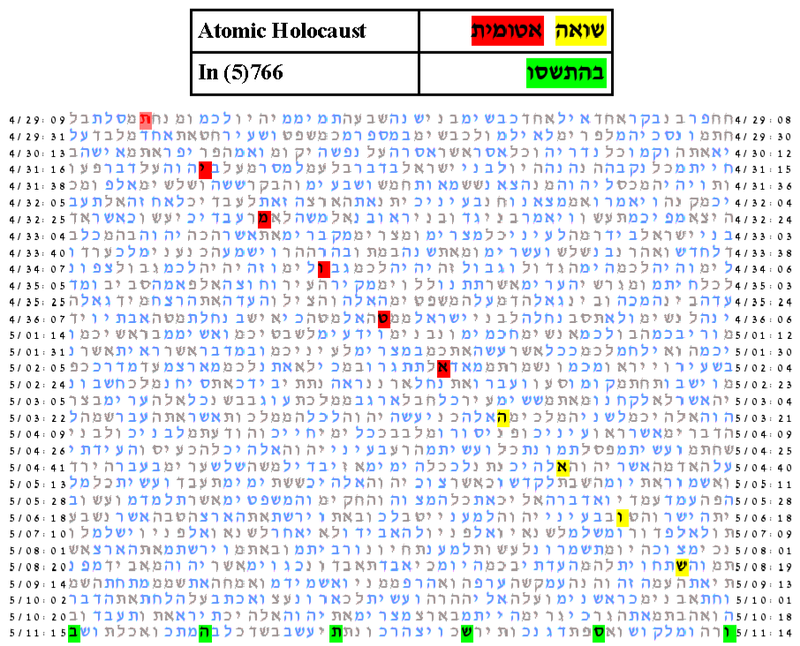 The table's key words were: שואה אטומית, atomic holocaust and בהתשסו in 5766, (2006). We did an experiment with these two key words in accordance with our altered experimental protocol where the maximum row skip or column skip is no more than 15. The smallest area table produced by the protocol is shown below. This table is shown in a better geometry than the corresponding table that appears on page 125. The probability that a text in the ELS random placement text population would have as compact a table, having at least one ELS of each of the key words as the one shown below is 588.5/10,000. The cylinder size produced by the search is 1,046. With expected number of ELSs set to 10, the probability that a text from the ELS random placement text population would produce a table as compact as the table produced here is 588.5/10,000. What was the basis of Drosnin's incorrect predictions? He had an initial hypothesis that if he found a relatively compact table, one that in some intuitive sense was unlikely to occur by chance, and if the table had key words that described some future possible event, then the table was predicting the event would occur. As these events did not occur, he had to revise his hypothesis that the relatively compact table was only indicating the possibility of the event. Of course the possibility that something might happen is not really any prediction at all, but in 1997 when the book was published, it was a good advertising to get people to buy his book which predicted catastrophies in 2000 and 2006. Indeed people did buy his book. 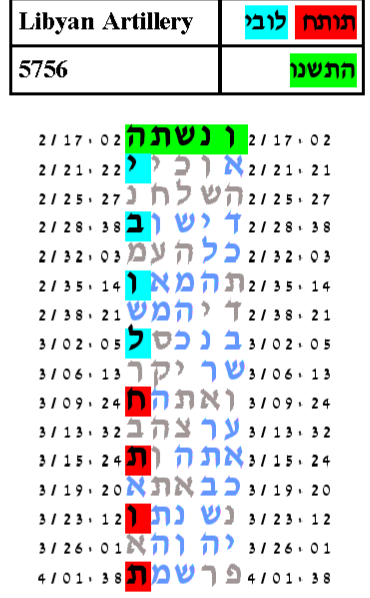 According to the Torah code hypothesis, if a major event happens, then some descriptive key words of the event is likely to have an associated relatively compact table in the Torah. However, relatively compact tables from the Torah text do not mean anything because there are many relatively compact tables that do not correspond to any event. Only if relatively compact tables had a one to one correspondence with events, could the finding of a relatively compact table be used for prediction. This point, that a major event happening implies a relatively compact table but a relatively compact table does not imply a major event is hard for many people to understand. It is not unusual for people untrained in logic to make arguments and mistake the a implies b proposition as equivalent to the b implies a. This unfortunately clouds the proper understanding of Torah codes.